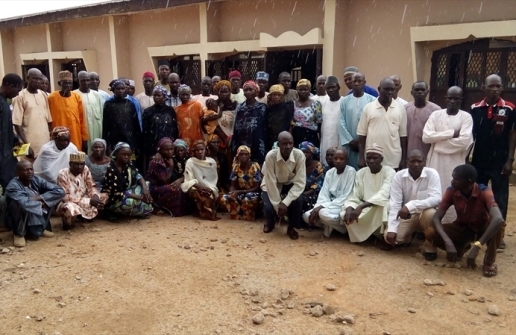 Parents of the abducted Chibok girls gather for trauma counselling with Open Doors International. Peter Pogu is as skinny as a reed. The tall man is bent over and on his shoulders rests an invisible burden that seems to weigh as much as the world itself. It has been a year and a half since 14 April, 2014 when his daughter Grace phoned him at three in the morning from Chibok Secondary School. But before Pogu could complete the conversation, the phone went dead. Helpless, Pogu woke his wife to tell her the devastating news. The couple cried for their daughter, fearing the worst. At daybreak, Pogu and a friend took his motorcycle and rode to Chibok to see for themselves. “We saw that all things had been burned, and I saw some uniforms of the girls just scattered. Then I started to cry,” he said. Pogu and a few of the other fathers set out immediately on their motorcycles in pursuit of their daughters. Along the way, they could see the destruction the insurgents had left behind. They seemed to have burned some of their vehicles by the side of the main road before they entered the forest with the girls. We are wounded in our hearts … Our heads are hurting, and our hearts are hurting always. Once inside the forest, the fathers came across another girl who had escaped. She told them the insurgents were not far away. The company of fathers pressed on until they came to a village. The sight of the lifeless body of a villager the abductors had killed was sobering. “The people told us, ‘It is better if you turn back. If you go near these people, they will kill you,” Pogu explained. Once back in Chibok, the army seemed to lack urgency and the fathers decided to try once more to pursue their daughters. “We just took our local [hunting] weapons and then at least 200 of us went to the bush,” said Pogu. Two days into the journey they reached a village where the locals told them the group of kidnappers with their daughters had passed earlier that day. But again the locals implored them and finally convinced them to turn back because they were no match for the rebels. Back home, the fathers called the Nigerian army commander in Biu and urged him to get help from the army headquarters in Abuja, which sent eight vehicles of army personnel. The fathers suggested they went together to try to free the girls, but the officers refused. They explained they were only there to protect the parents and that others had been sent to rescue the girls. “Our hearts were just beating … We just cried and cried and cried. And we went home,” said Pogu. Pogu has eight other children. His entire family has been left heartbroken by what has happened to their beloved Grace. The fact that schools have been closed all this time has not helped. The children are idle at home all day, having little else to do other than think about Grace. “When this thing happened, all of them were crying, crying, crying for Grace. And I also and their mum are just crying always because of this thing that has happened to us. Every time he thinks of Grace, or talks about Grace, Pogu cries. “When I am doing something, when the children [remind] me of this girl, then I start to cry. And they will say, ‘Why are you crying, Baba?’ and I say, ‘Nothing, nothing. Then I comfort them. That is what we are living [through] in my house. “We are wounded in our hearts … Our heads are hurting, and our hearts are hurting always. I am carrying my wife to the hospital and they said she has high blood pressure. That is what is worrying her. And me also, when I hear something about these girls, my tears are coming out, even when I am among our brothers, when they talk about [the girls], and then my tears are coming out always, and even when I eat food, and when I hear something, just something is beating in my heart. I cannot eat. I leave it. Always. Then even my body has become a worrying thing, because of all the thinking about my daughter. On top of this, his children have been traumatised by the constant insecurity they face. Every time they hear the sound of gunshots, they are terrified. On one occasion, one of his daughters ran into the bush and stayed away for an entire day. “I went up and down, up and down and didn’t see her. But in the evening I found her in another village and brought her back home. Up to now, when she hears something, she shakes, fearing that Boko Haram will come and abduct her like her sister. And then we just pray, pray, pray, pray always,” said Pogu.